US senators grilled President Trump’s nominee to head the nation’s top highway safety agency yesterday over autonomous vehicles and a long-delayed initiative to allow cars to communicate with each other over the air. 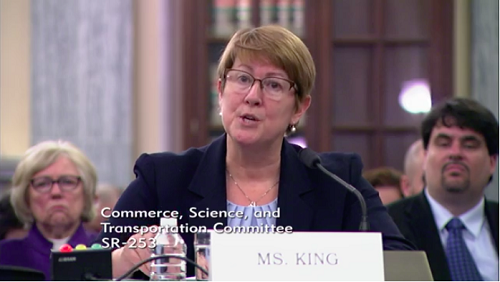 In a confirmation hearing for Heidi King, nominated to lead the National Highway Traffic Safety Administration (NHTSA), members of the Senate Commerce Committee asked King how the agency would safely push new technologies forward. The hearing highlighted the multiple hurdles that need to be overcome before AVs and connected cars, which all speakers agreed could make roads safer, can hit the road in significant numbers. One may be interference with wireless networks between cars. “37,461 of our friends and neighbors died in traffic crashes in 2016,” King told Sen. Gary Peters, a Democrat from Michigan. “That is why NHTSA would like to assure safety but remove barriers to adoption of advanced safety technologies that can reduce the fatalities and injuries on our roadways.” She pledged to implement the Senate’s AV START Act for self-driving car development if it should pass and support a block of radio spectrum set aside for connected-car networks in 1999. But Peters, who represents the heartland of the US auto industry, pressed King for a timeline to adopt rules for vehicle-to-vehicle (V2V) communication, a key component for AVs and a potential boon to all car models. The 5.9GHz spectrum is intended to be used for Dedicated Short-Range Communications (DSRC), a specialized system similar to WiFi that would allow cars to frequently transmit their location, speed, direction and other data to other cars nearby that have the technology. This information could be used to warn drivers if a car is going into the next intersection against the light, for example, preventing accidents. Some tech companies and cable operators have asked for access to some of the frequencies set aside for DSRC, saying automakers and the government have dragged their feet and hoarded spectrum that could be used for much-needed wireless capacity. Meanwhile, some vendors have promoted alternative V2V systems, such as Cellular V2X (C-V2X), as more powerful and better suited to emerging 5G networks. Last year, the Trump administration set aside plans to require V2V in all cars, according to an Associated Press report that cited unnamed auto executives. NHTSA said at the time that it had not made any final decision on the proposed rules. King, who has been running NHTSA as deputy administrator since September, said the agency is reviewing about 460 public comments on the proposal and studying technical issues, including possible radio interference. The Federal Communications Commission and the National Telecommunications and Information Administration are also involved. Sen. Catherine Cortez Masto, a Democrat from Nevada, said inconsistent and faded lane markings are holding back AVs in the US. Difficulty reading lane markings is also one of the reasons Audi has cited for not bringing a Level 3 partial automation system to the US next year. “What is NHTSA doing to ensure that our infrastructure is ready for AVs?” Cortez Masto asked. King made no commitments at the hearing but said NHTSA is partnering with vendors and agencies to promote AV safety.